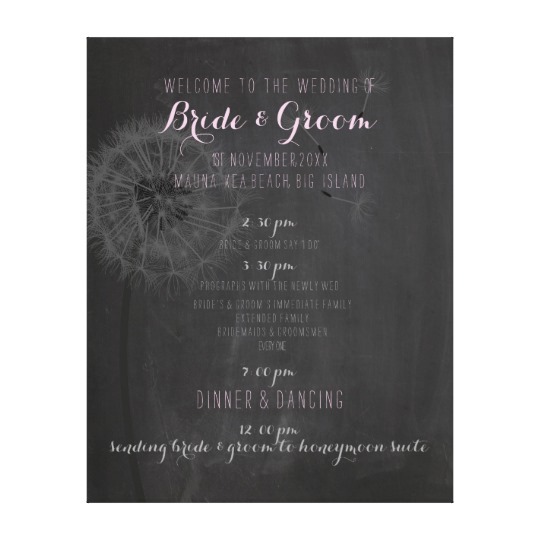 Are you looking for Ideas for wedding programs? 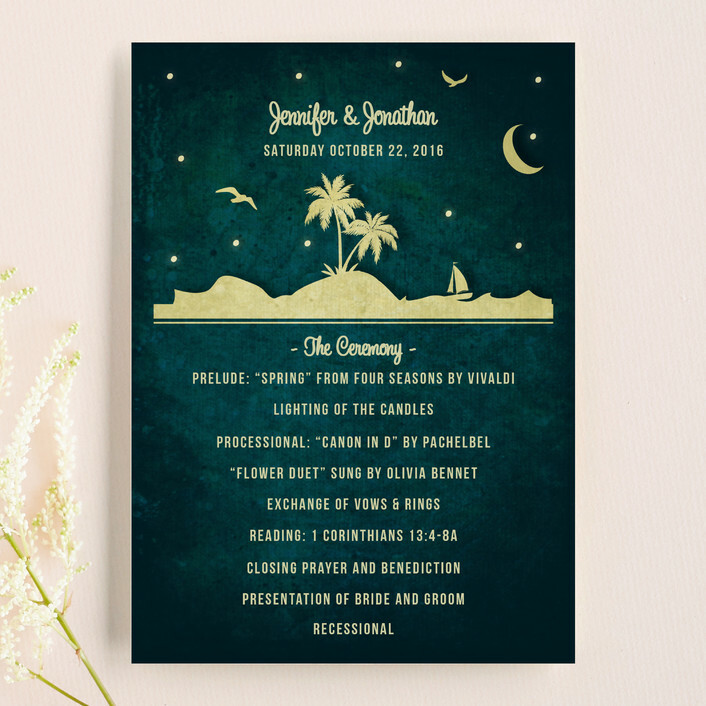 Wedding programs are a nice extra touch to your wedding as not everyone does them. 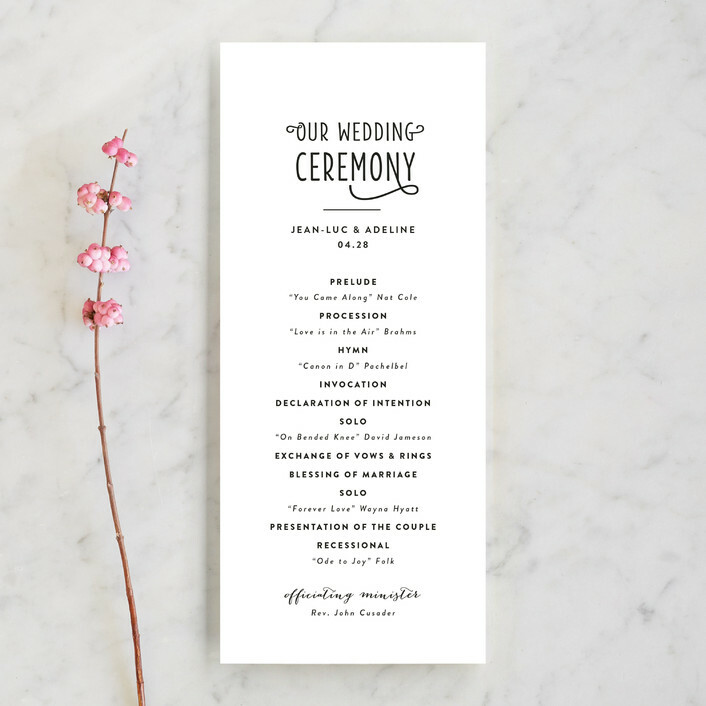 Today we are going to look at some different ideas on how you can incorporate the wedding program into your wedding ceremony or your wedding decorations. 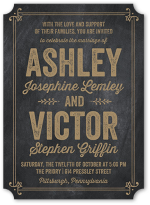 You can either choose to stick to a more traditional wedding program card or you can do something a little different with posters or crafts. 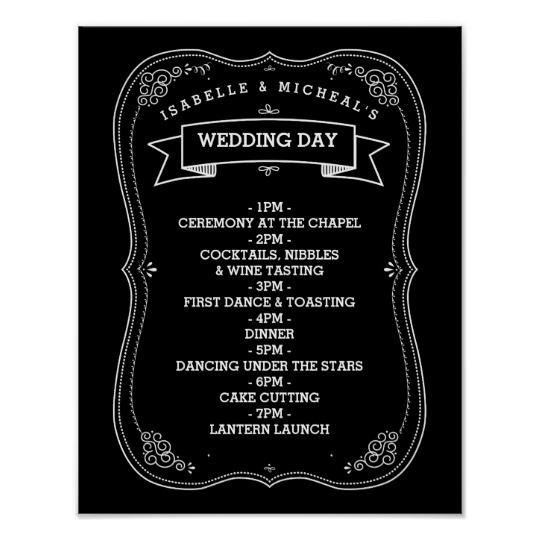 Do you like the idea of a wedding program but you are having a traditional wedding or you just want something basic? 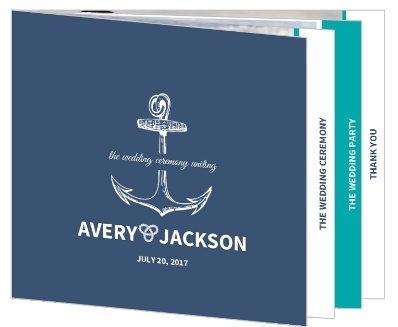 There are plenty of ceremony programs you can get that still do the job without going overboard in colors and elements that you are not looking for on this simple piece of stationery. 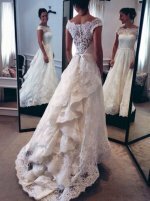 You have used your wedding colors everywhere else from the bridesmaid dresses and bouquets, to the centerpieces and favor design. This is just another place you could choose to use your wedding colors again. This is an especially good idea if you have a dramatic color combination or your colors are related the the season or the theme itself. 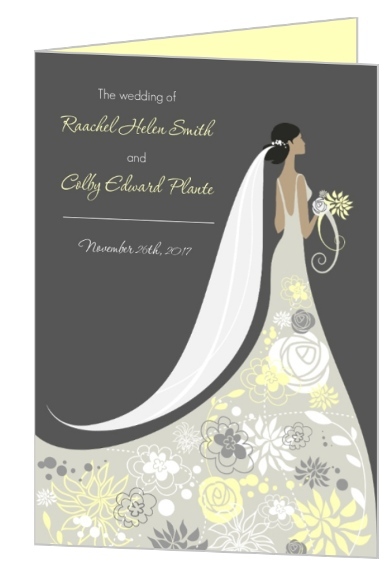 You can easily shop for wedding programs that include one or more of your colors and have them match the rest of your special day. 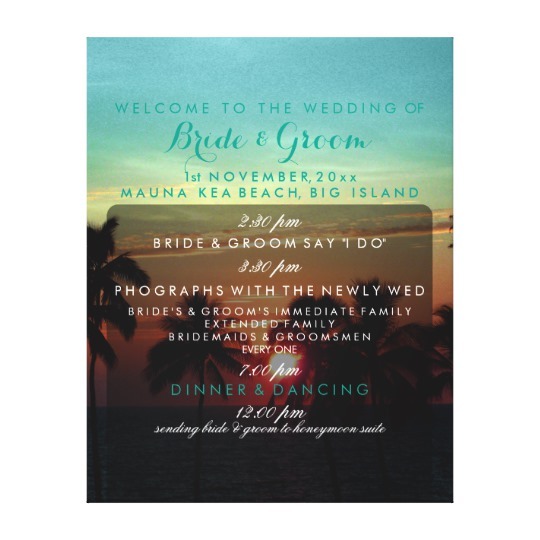 If you have chosen a wedding theme as well you could use the theme in the programs. 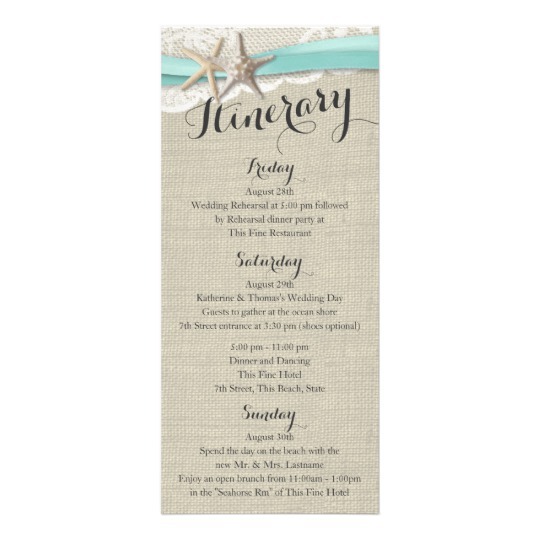 Some popular wedding themes include seasonal themes (spring, summer, fall, winter), the beach, rustic, modern, traditional, boho, nautical and holiday inspired. If you have one of those wedding themes or something completely different you may be able to match your theme to your programs. This will be another step in making your wedding memorable. Regardless of the theme or colors you choose, you might want your program to be more than just one piece of paper. 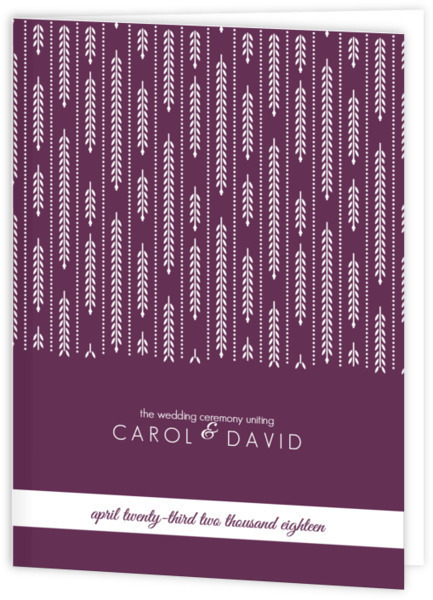 You can make a book or booklet wedding program instead. It can still just have the same info or you could choose to add extra elements including things like relationship history, how you met, how the proposal happened or personal things about each other like birthdays, birth place, schools attended. Have you designed a more whimsical wedding than most? Are you looking for modern and bold programs? 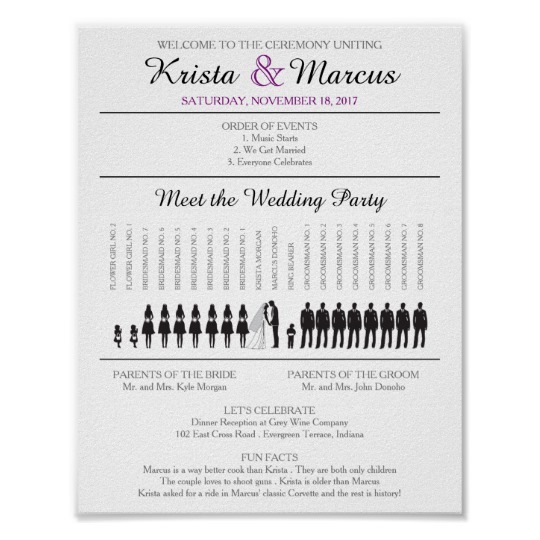 Do you want to choose stationery that is colorful and memorable? That is of course an option. 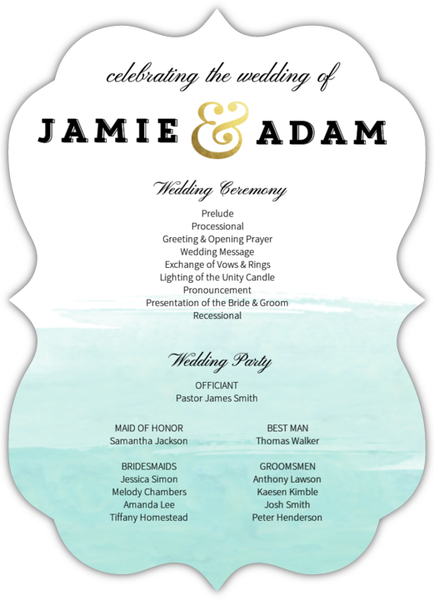 You can search for all the same elements that you did for wedding invitations such as bold colors, monograms, photo programs with the two of you smiling down at your guests or programs with flowers, watercolor paintings and more. 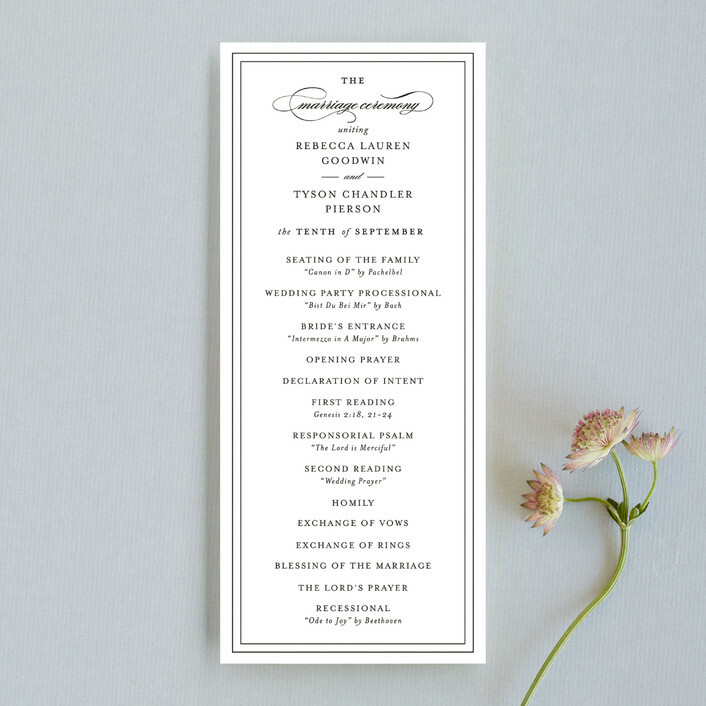 A popular wedding program choice is not just a piece of paper but also a fan. Many weddings are either held in warmer months or locations. 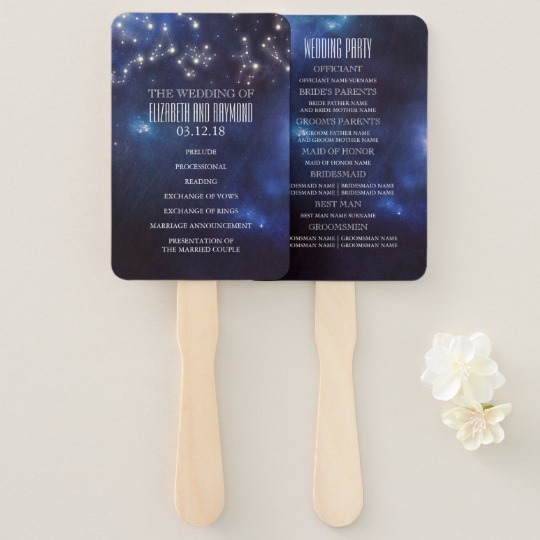 If your wedding is in a warmer time of the season and especially if the wedding ceremony or the reception will be held partially outdoors, you might want to consider a wedding program fan. 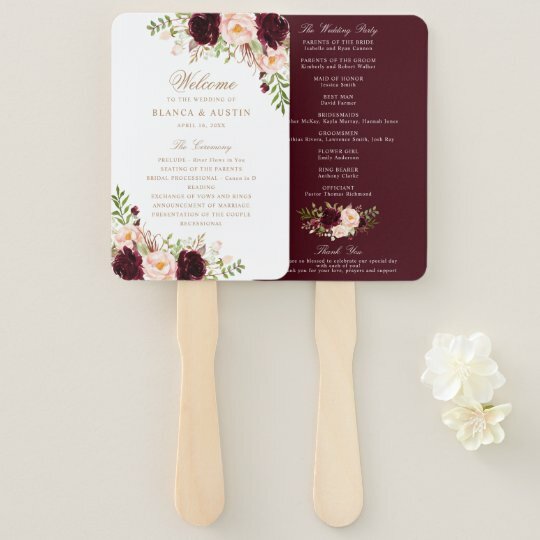 A Ceremony Program fan combines two great elements – a wedding program so your guests know what is going to happen and when and a fan so they can cool themselves off in the event that the church or other location gets too warm. 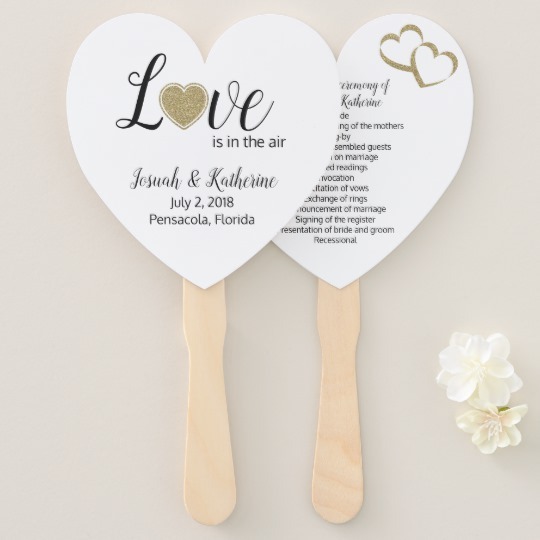 Besides being functional they can be super cute, make great keepsakes for your guests and show your guests that you are thinking of them and their comfort on your wedding day. 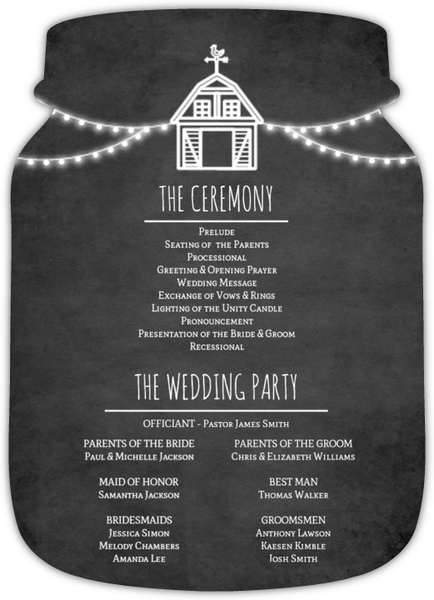 Many people like the idea of wedding programs but do not feel like each of their guests really needs a handheld program that lists each part of the ceremony (and reception if included). If you fall into this camp but you still like the idea of a program you can always purchase a wedding program poster instead. 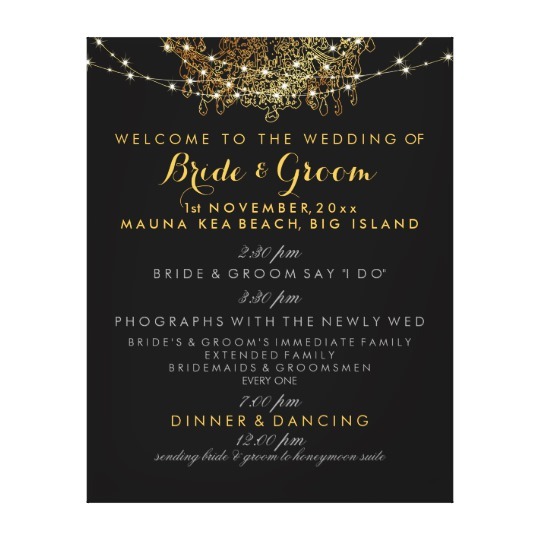 A program poster will allow you to still let your guests know what is going happen at your wedding but it will be in a central location where they can read it when they come in or see if from their seats depending on location choice. It also doubles as a nice additional wedding decoration. Some people like wedding posters but they want more choices. 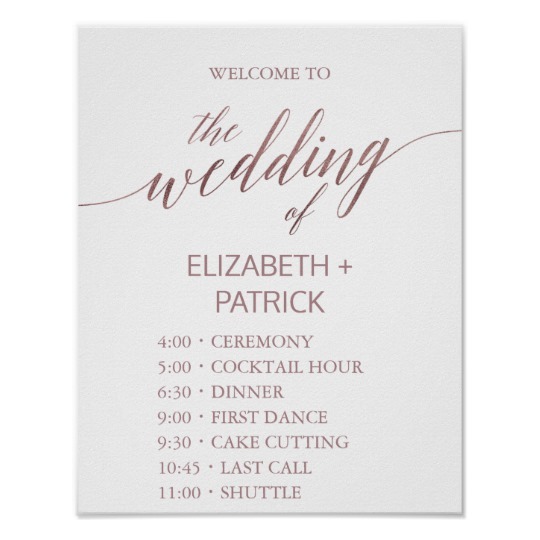 If this is you instead of a simple poster made of paper you can choose to use a wedding canvas print as your wedding program. 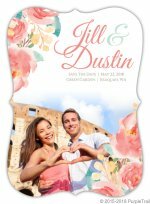 Although you could save a poster as well, a nicely wrapped canvas print will make an awesome keepsake for the couple for years to come. 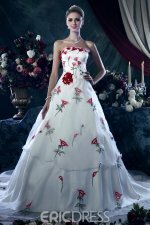 Now you have seen several different ideas for wedding programs. I hope you found some you like or at least have a better idea of where you will start.